As mentioned below, I bought a Bokashi Composter from Wiggly Wigglers back in Spring 2007. I have spent the past few months composting kitchen waste and I have to say I'm hooked. 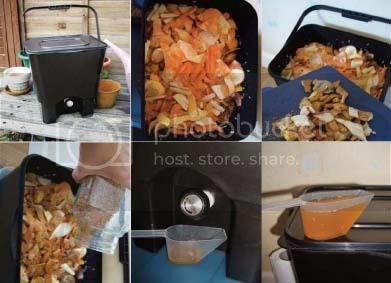 It has to be one of the best ways to compost food waste. It's easy, compact and there's no smell. Considering some of the food has been squashed into our Bokashi bin for over 3 months, the 'no-smell' aspect of Bokashi is a pleasant surprise to me. All those tiny Effective microOrganisms (or EMS for short) work like a dream. I've taken a montage of images showing the composting process. Basically you place kitchen waste (including meat and fish scraps, although not anything too creamy or milk based), squash it down, sprinkle the special Bokashi bran on top, seal the lid (carefully ensuring the lid is really firmly closed, any air getting in can ruin the composting process). Then sit back and let the EMS ferment your food. Every now and again you drain the liquid from the bin, dilute it with water and feed to your plants (you can use it to clean drains, but my plants love it so much, I haven't tried that yet). Once the bin is full (for our 2 person household that takes approx 1-2 months), you let it sit untouched for 14 days. Then you can either dig into your garden or add to a conventional compost heap. It breaks down amazingly rapidly, releasing large quantities of soil boosting probiotic micro-organisms which nourish the soil naturally. The Bokashi liquid is the best part about the whole process. My garden has loved every drop of it. 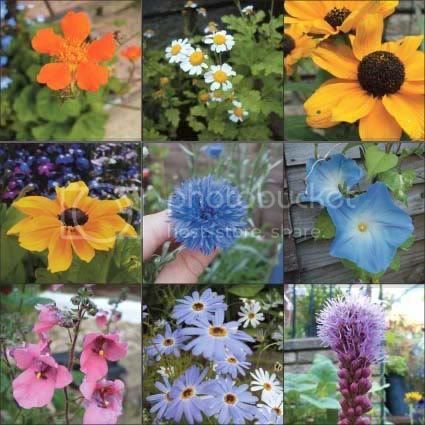 I have compiled a montage of a small selection of the plants grown in my garden this year, and as you can see they were all very healthy. I am a very satisfied user of Bokashi Bucket, and I find it's use quite convenient, and it's really good for my kitchen garden.